I am a southern gal and I have to admit that I really love southern style Korean food. If you ever visit Busan of South Korea, there is a district called Nampo-dong; very famous for their seafood street vendors and restaurants. You will smell smoky grilled fishes and other sea creatures on every little ally; Fun hang-out place with friends. 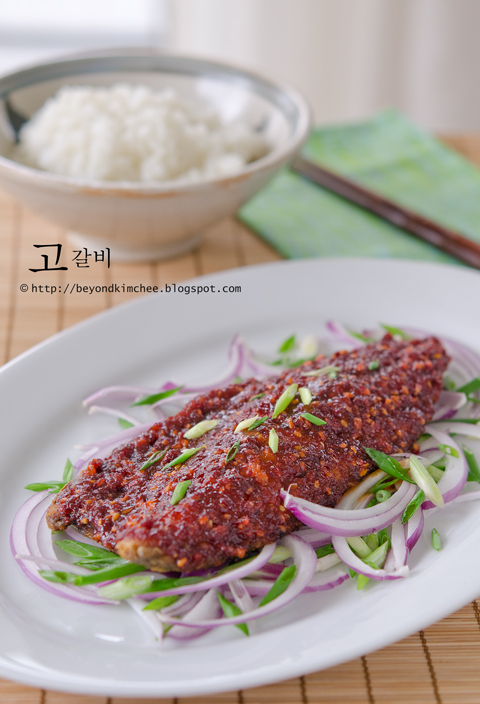 The dish I am introducing today is called “Go-galbi”, spicy Korean mackerel originated from Busan. It almost sounds like express take-out Korean BBQ dish but it is not. Well, it can be…, I guess. 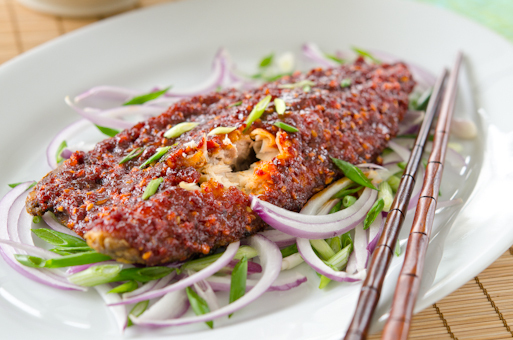 It is actually a mackerel(Go-deong-uh) slobbered in sweet tangy chili sauce. They call it “galbi” because it is cooked like galbi and meaty like galbi. I don’t own a open flame brick BBQ pit in my cosmopolitan cave, so I will adapt the traditional cooking method into my everyday humble skillet over the gas burner. It tastes as good as the ones in the restaurants. Otherwise you are missing something really, really, really, I mean really good Korean fish dish. And it is quite simple to make…, as always. After all, I am a simple person. Here are the stuffs I use to make today’s recipe. These are frozen mackerel fillets, individually wrapped. Only 3 fillets in the package…, some people just don’t like even numbers. 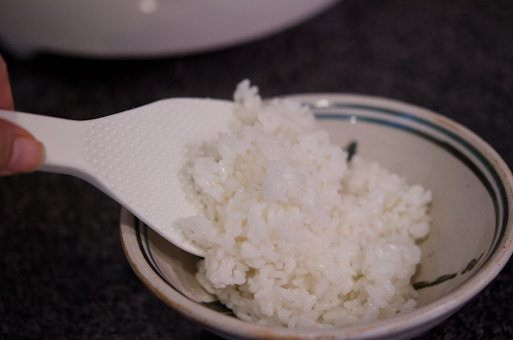 Wash some rice to make rice starch water by reserving the milky water that has been used to wash the rice. You only need about 2-3 cups. For the detailed instruction on how easily you can make this rice starch water, click HERE. 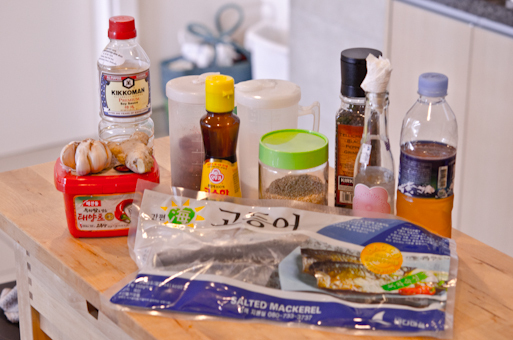 Drown your frozen fishes in the rice starch water for 20 minutes. #1 : They are salted in the package, more than you need. Need to get diluted. 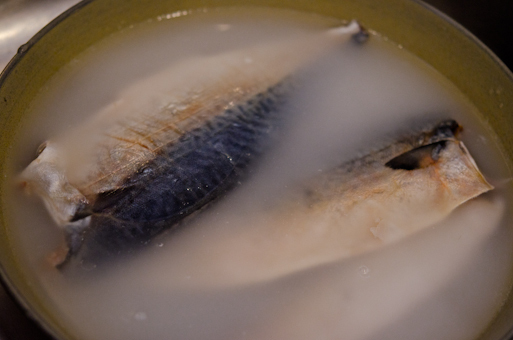 #2 : As they’re thawing, the starch water will reduce the fish smell during the cooking. Please, don’t ask me for the food scientific reason how it works, because I simply don’t know, but it works like a wonder. 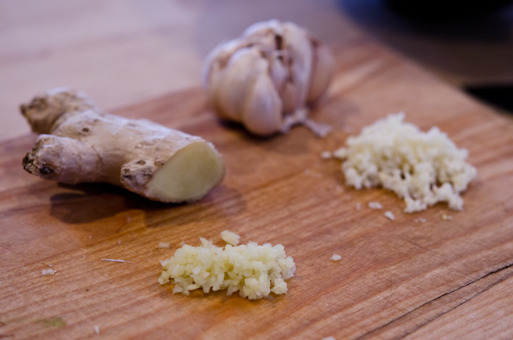 Meanwhile finely chop your garlic and ginger so you don’t get bored while waiting. 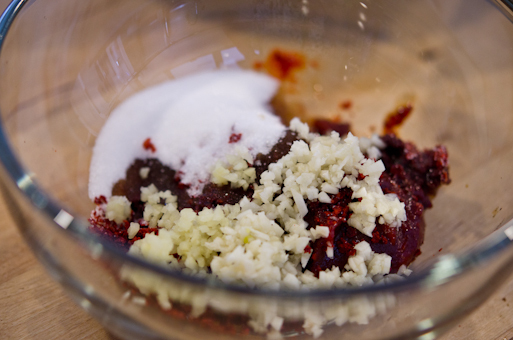 In a small mixing bowl, combine garlic, ginger, chili paste, chili flakes, soy sauce, sugar, rice wine, sesame oil and sesame seeds. Now here is the problem that I am encountering because none of you will be able to find this ingredient outside of Korea. 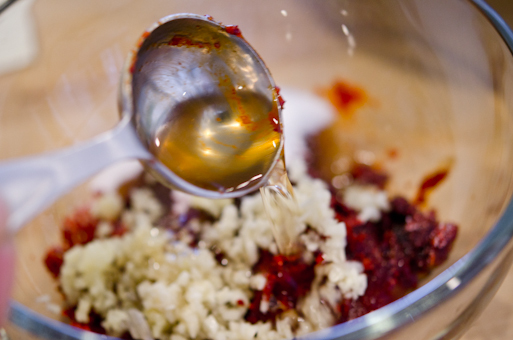 It is a type of extract called “maeshil jeup” – the home-made kind. I could never find this anywhere in the U.S.
Sweet tangy syrup that comes from the green plums. This is NOT a plum sauce or juice! So I will give you the substitution. Use lemon juice with corn syrup instead. When 20 minutes are over, Deliver your fishes out of water and pat them with paper towel. 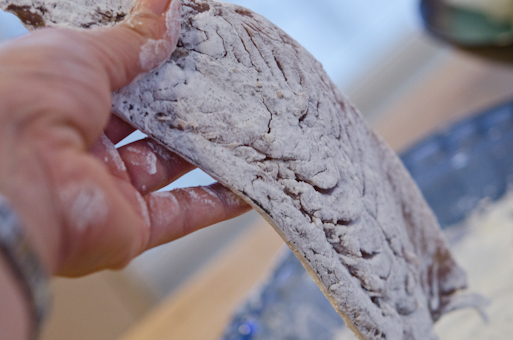 Gently coat them lightly with corn starch on both sides. Heat some oil on the skillet over medium heat. Sear the skin side for 3-4 minutes until it gets NGB-nice golden brown. Flip and sear the flesh side for 3-4 minutes, too. Flip back so the flesh side is staring at you. Important! Reduce heat to low. Drizzle 1 Tbsp of sauce on top. Put the lid on or cover with aluminum foil and continue to cook for another 5 minutes. This will set the sauce on the fillet nicely. 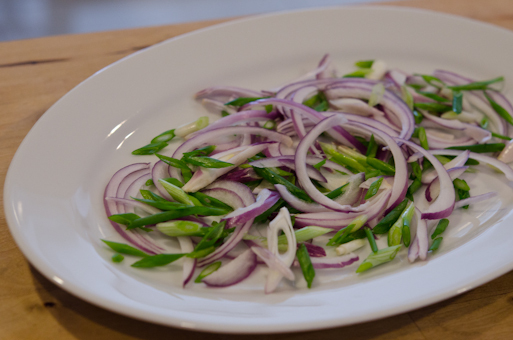 While waiting slice some onions and scatter them on a serving platter. When your fish is done, lay it on top of the fluffy onion bed. Now, hurry up and grab a bowl of hot freshly cooked rice. Don’t miss this Holy mackerel! * : Rinse the rice once and drain. Add 2-3 cups of water and rapidly swirl around the rice. 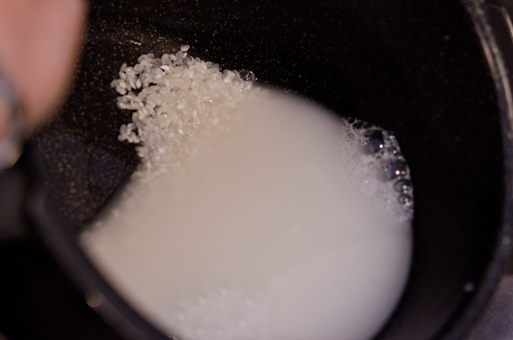 The water will take some starch out of rice and becomes milky. Reserve the milky water. ** : Substitute with 2 tsp fresh lemon juice + 1 Tbsp corn syrup. 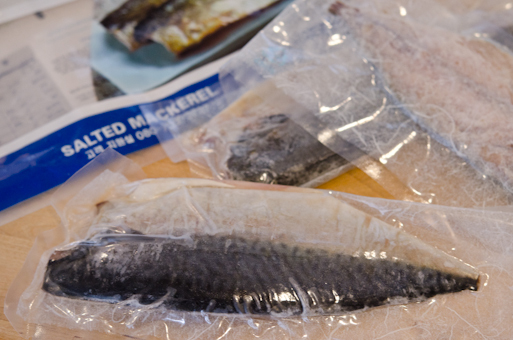 Take the frozen mackerel fillet out of package and soak in the rice starch water for 20 minutes to thaw. Meanwhile make the sauce by mixing all the ingredients. 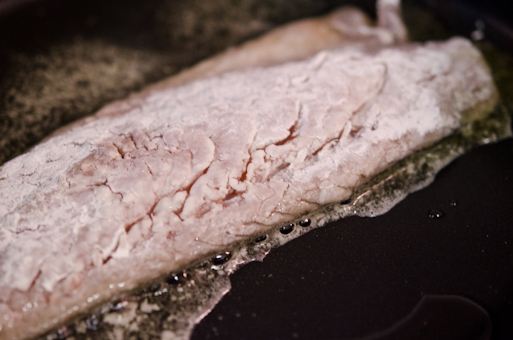 Take the fillets out of starch water and pat with paper towel to dry. Coat with corn starch lightly on both sides. 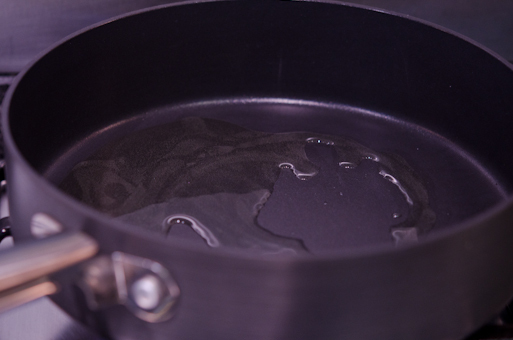 Heat oil in the nonstick surface skillet over medium heat. Sear the fillet, the skin side first, for 3-4 minutes. Flip and sear the other side for 3-4 minutes as well. 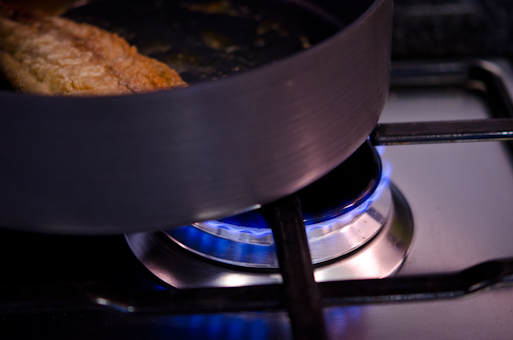 Reduce the heat to low, and turn the fillet again so the meaty side is facing you. 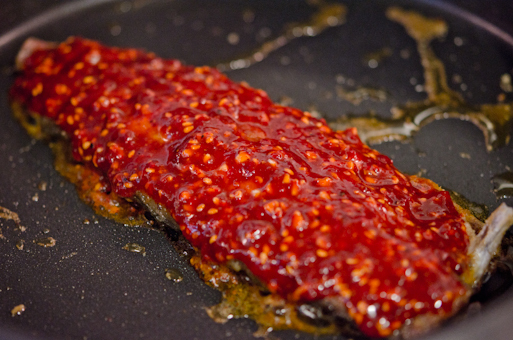 Spread the sauce over the fillets all around, about 1 Tbsp per fillet. 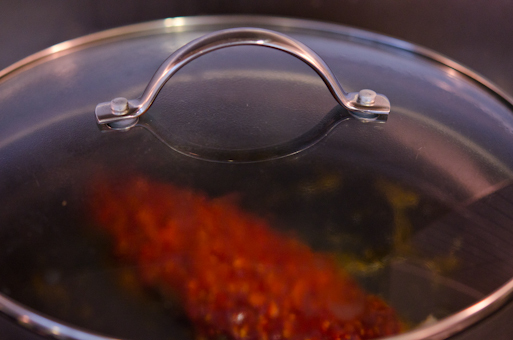 Cover with lid and simmer for 5 minutes so the sauce can set on the fillets. Place fillets over onions on the platter and serve warm with rice. Enjoy! 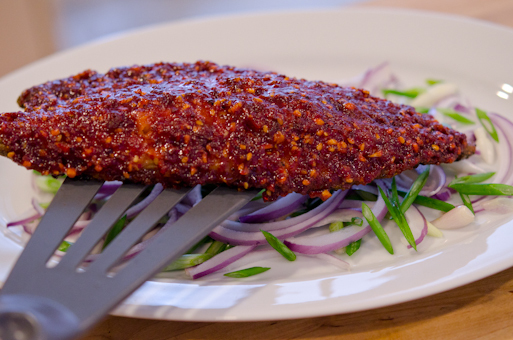 So red and spicy - it's certainly got my appetite fired up! Yeo-su is beautiful place and quite close to my hometown. I have been there a few times as a young child. Hope you can give this a try at home. Thanks for the comment! Yes, it is somewhat spicy but so good. Holly, this is another great recipe. 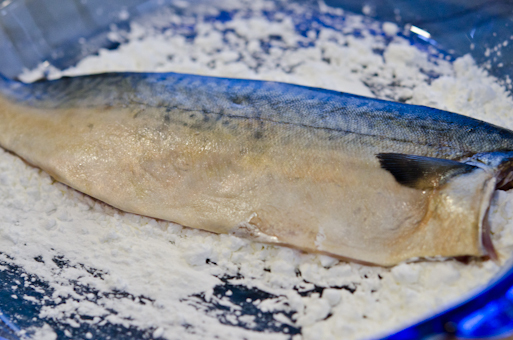 I LOVE mackerel for its texture and taste. When I grew up in a coastal town in Vietnam, this kind of fish were abundant and we used to grill the fresh ones just came from the sea as snack. I always love the fragrance of its fresh meat. I am a seafood person because of my childhood background, too. But living in America and not having easy access to fresh fish is very frustrating. I also have this inherent distrust for frozen seafood, particularly when they come in package made in China because you never know what kind of poison they put in there to keep the fish appear to be fresh. On a slightly different note -- I have KBS World channel at home (the only reason I subjected to pay $90/month for a satellite package is because of this channel!) and love watching this one show calls "Korean Cuisine". The host would travel to different parts of Korea to showcase local dishes or or culinary themes. I love it because I learn so much about Korean food, culture and its beautiful landscape. I record every single show and watch them religiously! I think next to Vietnamese cuisine, Korean is my favorite. 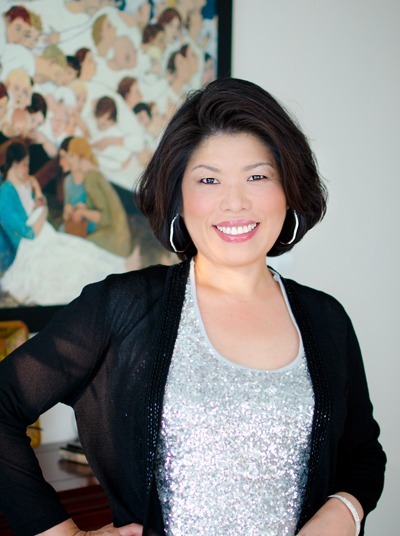 I am pregnant with my second child, and I want to have more korean dishes corporate into my daily healthy meals. 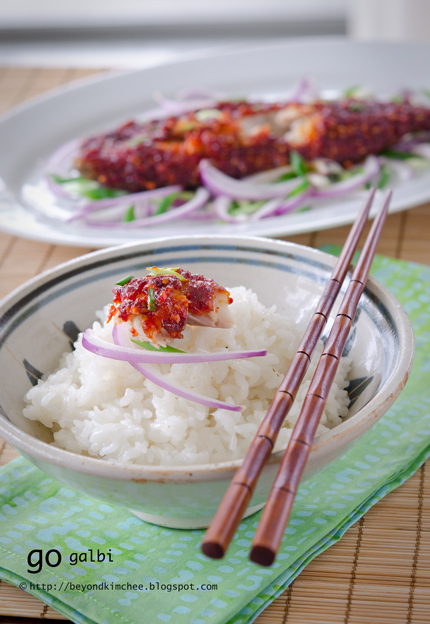 Do you have any suggestion for dishes that are commonly known for pregnant women in Korea? 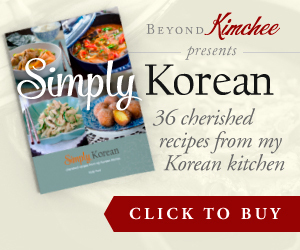 Hmm, talking about food, I need to make a trip to the Korean grocery store this coming weekend. I need red pepper paste and soybean paste, and some kelp! I haven't seen the Korean cuisine show and I better check if my tv channel has this program. There is one channel in KL that shows Korean dramas & etc, but I hardly watch. For the dishes for pregnant women? There are no particular dish that are common to them, but they tend to choose dishes more carefully avoiding highly processed food and consume more fresh products. Some takes herbal supplement that is prescribed by their doctor to help baby to gain more nutrition and ease the discomfort during their pregnancy. If you are pregnant, don't eat the blue skinned fish such as this mackerel, or tuna too often since they contain high in mercury. Once a week is more than adequate. This looks perfect with that bowl of rice! You wouldn't need anything else. This is so good. I just finished a plate of this, some jasmine rice and some fried egg tofu. So delicious. I will definitely be making this again and frequently. Thank you. 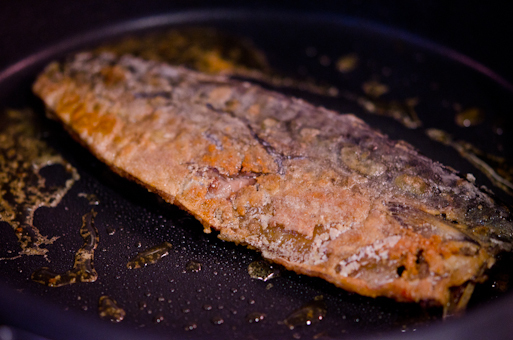 can I use other fish fillets for this, like Bangus(milkfish)? 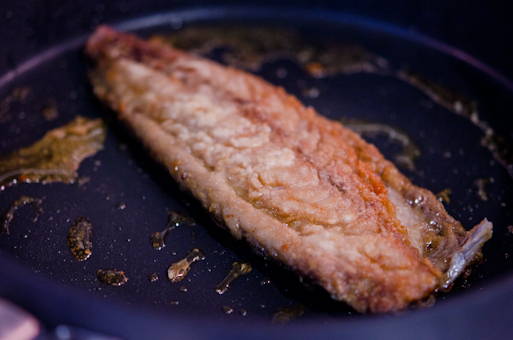 I don't think I have seen the Bangus(milk fish) but as long as the flesh is firm and hold its shape, it should work. Just made this for dinner tonight. I had to cut back on the spice since my hubby can't handle this heat, and my 2 year old is still building up a tolerance to heat. 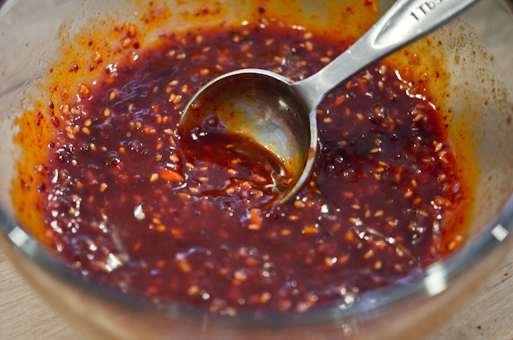 I only used 1 tablespoon each of gochugaru & gochujang. I prefer to sweat when I eat Korean ... But have to hold back the heat for the men in my life! I loved this sauce. 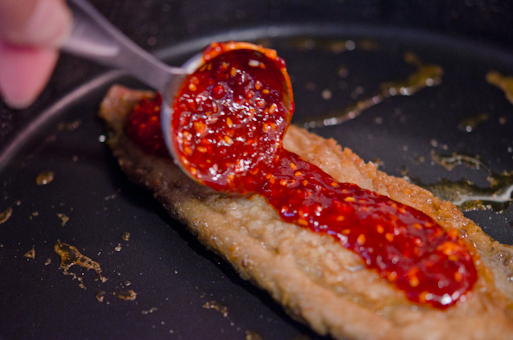 I will only fry my mackerel this way in the future. Can't wait to try another of your recipes!!!! Wow, if your 2 year old can tolerate even a little heat, that is impressive. My 9 year old is still having a hard time. I am glad that you liked this recipe. Thanks for the comment. By the way, anyone looking for Maeshil can find it in any Korean market in Los Angeles or at Gobugi market in Portland, OR. It's usually 13 bucks a liter, but it lasts a long long time. Thanks for the link. It is nice to know to have a resouce for an item that is hard to find in local markets. This recipe definitely has a place in my future. I am going to give tamarind sauce a try as a replacement for the green plum syrup. There are a few Korean restaurants and large Asian supermarkets nearby, so I may even be able to track down the real deal.